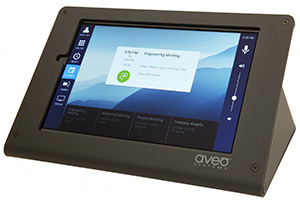 Next week at InfoComm 2017, Aveo Systems is introducing two tools — Mira Connect and Mira Portal — designed to make it easy to use collaboration products and rooms. Mira Connect is a touchscreen tabletop control appliance, while Mira Portal is a cloud management platform used with Mira Connect to set up and manage individual rooms and sites. Together, the tools allow system integrators to "easily install controllers in more rooms, reduce system costs and complexity, increase user satisfaction, and efficiently deliver remote management services," according to a company statement. Mira Connect can dial calls, adjust audio settings, manage projects and displays, control the room and more. The touchscreen interface can "initiate audio and video calls by selecting participants from a directory, dialing directly, or, with Microsoft Office 365 integration, dialing scheduled meetings with one touch of a calendar invite." The device's user interface can be designed with custom colors and graphics such as a logo or background image. Mira Portal allows integrators to add collaboration devices to a room, creating a set list of control points to choose from during setup. The system then automatically generates the user interface for the room. Changes to equipment or settings can be made via Mira Portal's dashboard, and the system can generate text-message alerts in the event of equipment problems. In addition, authorized users (such as IT teams) can use the system to securely control a room remotely via web browser. Mira Connect and Portal are compatible with collaboration systems and displays from Polycom, QSC, Biamp, Sharp, NEC and more. For more information, go to the Aveo Systems site.